The Empress of the Seas should be renamed to Disaster of the Seas. The ship had sewer gas smell throughout particularly in the starboard end of the ship all the way from the third-floor up to the 10th floor sewer gas smell was prevalent and sickening. 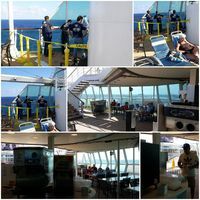 Moreover there was active construction with inadequate shielding of construction debris rust dust from grinding and white paint flakes alongd with other Airborne Contamination Particulates that exposed the passengers during the cruise. The 1 small swimming pool was closed for the first 2-1/2 days and the 4 jacuzzi spa were closed off for the entire cruose..